Pacifico Minerals (ASX:PMY) has entered into a Binding Option and Terms to Purchase agreement to acquire all issued capital in Minera GS S.S. de C.V., a private gold mining and exploration company incorporated in Mexico. 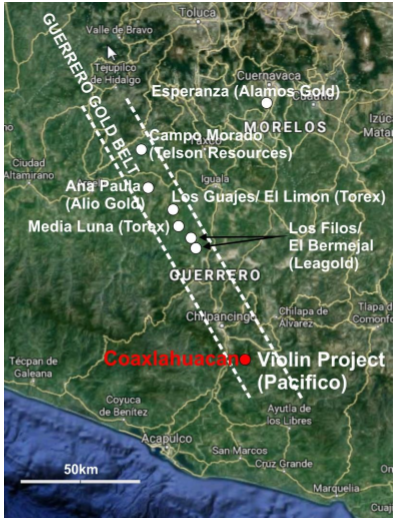 As a result of the agreement, PMY will acquire the rights to the highly prospective Violin project, which is situated within the Mexican Guerrero gold belt (below). The project contains several gold deposits and mines. Mineralisation in the region is related to gold bearing iron skarn porphyries and occur within faults and around the igneous intrusions. Exploration at the Violin project to date includes in-depth geochemistry via 10,649 soil samples, which covers most of the licence area. The Guerrero Gold Belt contains tertiary tonalite, granodiorite and monzodiorite porphyries intruded into Cretaceous limestones and sandstones. Skarn zones exist between the igneous intrusions and the carbonate-rich country rock, and within them iron minerals dominate – including magnetite, hematite and pyrite as well as quartz, sericite, clays, gold and copper sulphide minerals. It should be noted here that PMY remains a speculative stock and investors should seek professional financial advice if considering this stock for their portfolio. The Coaxlahuacan prospect is the most advanced prospect within the Violin project and holds the most interest for PMY moving forward, with the company indicating that it will explore drill targets as soon as possible. While undertaking the due diligence process, PMY’s geological team noted extensive copper mineralisation in the form of chalcocite and malachite at Coaxlahuacan. Past work at the site has included an IP and ground magnetic survey, with five check channel samples returning an average of 0.4g/t gold and 0.70% copper. Visible observed surface indications of extensive copper gold mineralisation occur over an area of 500 x 100m in the lower lying anomalous area. Pre-erosion weathering and leaching of the copper has resulted in the copper being detected in gullies only. The soils over this zone, which are open to the south, show an anomalous area of 500m x 300m that contains soil sample values of >100ppb gold. A gold only anomaly to the north and east of the above area lies within an area of saprolite cover. Within this zone, returns exceeding 50ppb gold are found over an area of 1.6kmx1.3km. 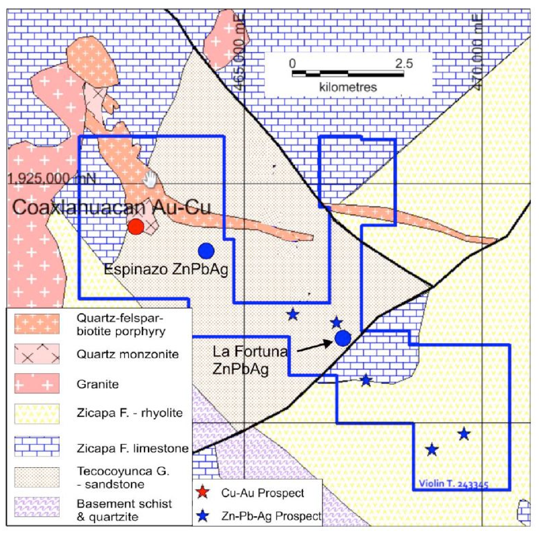 While the company’s due diligence site visit centred on the Coaxlahuacan prospect, it has considerable interest in the Fortuna and Espinazo zinc, lead, and silver prospects (within the same tenement) with investigations at both sites indicating sedex-style mineralisation. At Fortuna, the average value of 10 dump and rock chip samples previously collected is 5.2% zinc, 4.5% lead and 220g/t silver. Pacifico plans to rapidly confirm drill targets and commence drilling as soon as practical, in order to advance towards establishing resources. In consideration of a payment of US$50,000 in cash and 10,000,000 fully paid ordinary shares in the issued capital of PMY, the company is granted the sole and exclusive option for a period of nine months to purchase all the issued capital in Minera GS free from any debts, liens, charges, encumbrances or other adverse interests. PMY must also meet the minimum expenditure requirements for the project for CY2018, which is 871,353 Mexican Pesos (approximately US$47,000). During the period, PMY will have full access to the project and may complete all forms of exploration, including drilling. If PMY chooses to exercise the Option, it will pay a total of US$250,000 and 20,000,000 of its fully paid ordinary shares. Should the gold price on the LME hit US$1,500/ounce on or before the Option is exercised, PMY will be required to issue an additional 10,000,000 fully paid ordinary shares at the time of exercise of the option. 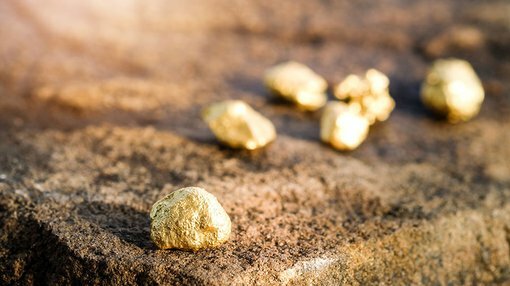 Further, Minera GS will be entitled to a A$1,000,000 cash payment upon the delineation of a JORC 500,000 ounces of gold (or equivalent) Indicated Resource of economically mineable material at the project. Should a Bankable Feasibility Study be completed and confirm more than 1 million ounces, PMY will be required to pay A$3,000,000 in cash to Minera GS.